Posted November 21, 2018 by Diane & filed under Book Recommendations, Miscellaneous. I’ve been pondering this week about what book for which I’m most thankful. And while there are many that I’ve read this year and in the past few years, the one that comes to the very top is a book that made me who I am as an author. It’s a book that was dropped into my hands by my mother when I was 13 and lounging in a flat in North London. “I think you might like this,” she said. 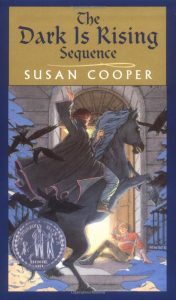 It was Susan Cooper’s The Dark is Rising, a tale of British lore and a midwinter’s night from a New Englander from England. And though it took place in another world from the Maine where I’d grown up, I’d never read anything that felt more like home. Will Stanton was like me with his chore-filled childhood in a rural place. He dealt with siblings who were not always kind, but ultimately were good to him. He had to go out into the dark to feed the chickens. (I remember my own treks to our shed in the snow at dusk, shooing hens and ducks in, feeding them and giving them fresh water from a bucket I carried all that way; then wandering back in the utter darkness knowing that there were foxes, coyotes, and maybe more in the woods around me.) I feared the dark of those woods. And I felt a tinge of them in Will’s Dark, which wasn’t simply the world after dusk but a malevolent force intent on world mastery. Yes, I was at home. This story—of the seventh son of a seventh son, an Old One with powers that came on his 13th birthday, a boy who sought to outsmart a cruel force throughout shifting times with mysteries, ancient texts, betrayal, and hope surrounding him—showed me how a book could feel like home while opening up a whole new world. I’m most grateful to it because it inspired me to start writing my first novel. I’ve never read this one, Diane, but it sounds great 😀 Here’s to inspiration! It’s a fantastic read, and if you enjoy British legends at all, it stands up to time quite well. The whole series is wonderful, steeped in lore!